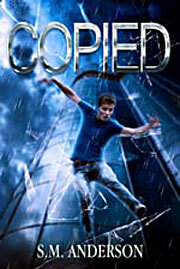 I’ve read and enjoyed two of James Wesley, Rawles’ other books in this series. 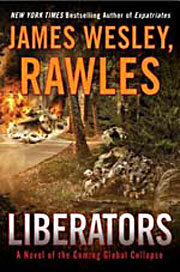 Thus I looked forward to the latest, Liberators (Amazon link) It’s the story of two groups of protagonists trying to survive through the occupation of the United States and Canada following “the Crunch,” when most of the worlds’ economies have collapsed, with ensuing civil disorder, scarcity of food and fuel, and governments in disarray. There are several books in the series, all taking place during the same years, but with different characters in different parts of the world. Liberators is certainly engaging. So, let’s say that the universe we live in had a place where all the space-emergent species, from all the scattered worlds in it, belonged to a structure run by an organization that was a cross between the United Nations and Las Vegas. And, Earth’s humans are the newbies. Welcome to the second novel in the Grand Central Arena series. 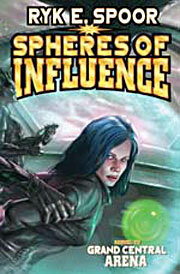 Spheres of Influence, by Ryk E. Spoor (Amazon link) is a joyous romp in an unusually clever sci-fi fantasy story that you and your kids can enjoy. 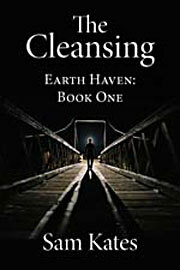 Just released by Smithcraft Press, The Cleansing (Earth Haven) Book One, by Sam Kates tells a familiar story of a deadly virus killing off nearly all of the 7-billion people on Earth. What distinguishes this story is that the disease was intentionally spread by a group of 5,000 aliens who look just like us and are living amongst us. They’ve been on Earth for 5,000 years, waiting for a sign from their home planet that the rest of their species would soon be arriving. Hence, the need to cleanse the Earth of humans so it can become the haven for the soon-to-arrive aliens. 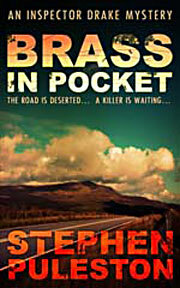 The first of the Inspector Ian Drake series, Brass in Pocket, by Stephen Puleston (Amazon link) is superb. If you like your police procedurals to also feature high-tension, urgency, and action, this is the book for you. You’re just a teenage boy, doing the things boys love to do. Then, someone tries to poison you. You’re framed for a fire that injures your friend, and further attempts are made on your life. The killer? It’s you! Copied, by S.M. Anderson, from Curiosity Quills Press (Amazon link) is a first-rate thriller with science fiction overtones that explores several ethical questions including the issue of genetic engineering, human cloning, and the prospect that a corporation can “own” a clone because they own the DNA of that person. This series has become a staple purchase for me. 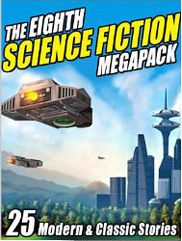 The Eighth Science-Fiction Megapack is a terrific bargain for just 99-cents. Hours — and I do mean hours — of enjoyable reading. I wasn’t crazy about the very first one, but following that, these books have presented a very nice, representative mix of the genre. Some stories are older, but most are of recent vintage, culled from various sci-fi magazines and collections of originals. Short review: A superbly entertaining science fiction novel with a fascinatingly complex and well thought out plot. Okay, you need more than that to pay the price of admission, right? I don’t blame you! 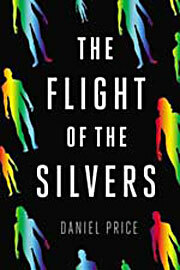 The long review: The Flight of the Silvers, by Daniel Price (Amazon link) is the type of novel that all science fiction authors should aspire to write. According to the author notes, Mr. Price spent three years writing this marvelous story and it shows in the intimately drawn characters, with all of their flaws, insecurities, strengths, and especially their personalities. Without trying to be political, it seems that as the mood of the country becomes more polarized and angry — and I’m not pointing any fingers — there’s been a large uptick in novels about a new civil war, or in this case, a second revolution. 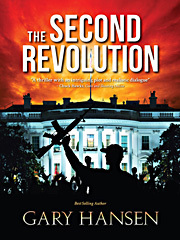 The Second Revolution, by Gary Hansen (Amazon link) is better written than many of them and presents a clear case where action is needed. Though there isn’t an actual revolutionary war involved, there is an uprising against a stunningly corrupt president. When you die, you simply wake up in another world, possibly in another universe. It’s not reincarnation in the classic sense, since you usually arrive at the age you were at, at “death,” and your memories are intact. Earth is an original-born world, not one of the steps along the way. Eventually, when it’s time to really die — if you’ve “earned it” — you wind up on a strange, squalid world known as the City Unspoken. That’s the premise of The Waking Engine, by David Edison. 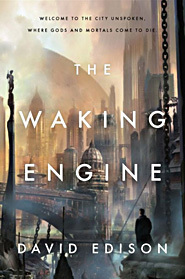 This big book is a heady mixture of science-fiction, fantasy, and horror, with an ambitious plot: Something has gone wrong with the machine that actually allows the mix of creatures from various worlds to finally rest in peace. The City Unspoken is becoming overcrowded, out of control, and various forms of ennui, or insanity, are rising. Some 45-years ago, the Boyscout troop I was in went on an overnight camping trip in late November. It rained and then snowed and we were huddled in our tents, and half of us got the stomach bug. 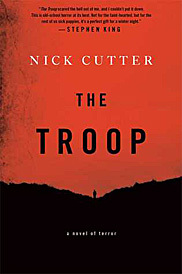 Thinking back on it, that was a walk in the park compared to what The Troop, by Nick Cutter faces as the five of them and their scoutmaster begin a weekend camping trip on a small, deserted island off the coast of Prince Edward Island. The short review: Frightening, relentless, graphically gory.